Gluten Sugar Dairy Free had a pepper steak recipe that is simple, delicious, and basically cooks itself. Serve this over brown rice (or cauliflower rice for strict Palelo folks), with your favorite vegetables and you have a complete, healthy, Paleo meal. Slice sirloin into strips, slicing across the grain into one inch strips. Heat a large frying pan on medium high heat. Once pan is hot set sirloin strips in and let sit 2-4 minutes or until they release from pan easily. You don’t need oil since the natural liquid from the beef will release into the pan. Remove sirloin from heat on to platter. Whisk stock with cornstarch and add to slow cooker. If you don’t have beef stock, chicken or vegetable stock will work just fine. Use stock, never water! Add all other ingredients (except cilantro and lime) to slow cooker and stir to combine. Add sirloin to slow cooker and gently mix well. Cover. Set on high and cook for 3-4 hours or low for 6-8 hours. Stir once during the cooking. Chop cilantro and cut lime slices and set aside. Once the beef has cooked, taste and check to see if you need to add more salt or pepper before serving. Top each serving with a squeeze of lime, and cilantro. This week’s Meatless Monday post comes from Craving Something Healthy and it is a perfect recipe for the upcoming Labor Day weekend! For the spice blend, mix all spices, salt and pepper together in a small bowl. Wash and prepare vegetables as directed. Place vegetables in a very large mixing bowl and drizzle with olive oil. Toss gently to coat with oil. Sprinkle spice mix over vegetables and gently toss and rub spice mix into vegetables. Let coated vegetables sit for 10-15 minutes. 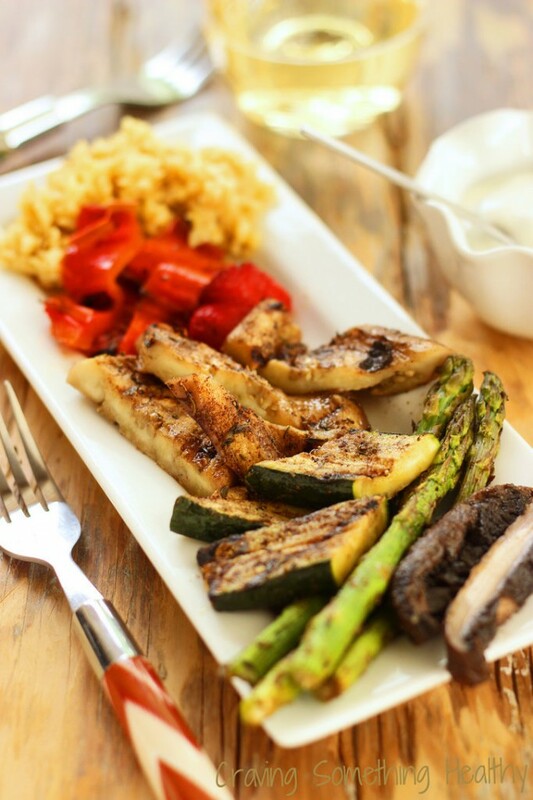 Working in batches as necessary, grill vegetables until tender and lightly charred on each side, about 8-10 minutes per batch. Let vegetables cool slightly, and then slice into serving pieces. For yogurt sauce, mix together Greek yogurt, lime juice, zest and scallions. Season with a pinch of salt if desired. Serve with yogurt sauce, and brown basmati rice if desired. Try this meatloaf from Deliciously Organic that was featured on Paleo Parents . It’s wrapped in bacon so you know it’s good. Preheat the oven to 350°F and adjust the rack to the middle position. Heat the coconut oil over medium heat in a large skillet. Add the carrot, celery, and bell pepper and sauté for 5 to 7 minutes, until soft. Move the vegetables to the sides of the pan and add the salt and thyme to the center. Stir until fragrant, about 30 seconds, then stir the thyme into the vegetables. Remove the pan from the heat, and let the mixture cool for about 10 minutes. Place the eggs and liver in the bowl of a food processor or blender and blend until smooth. Place the ground beef, almond flour, and liver mixture in a large bowl. Add the cooled vegetables and stir until combined. Pour the mixture into a 9×11-inch baking dish and form into a large loaf. Arrange the bacon in a criss-cross pattern on top and use a pastry brush to brush the top with maple syrup. Pour 3/4 cup water in the bottom of the pan. (This keeps the meatloaf moist.) Bake for 1 1/2 hours, or until golden brown. Let the meatloaf rest for 10 minutes before serving. Simplex Food has a great, simple recipe for a spaghetti squash bake. 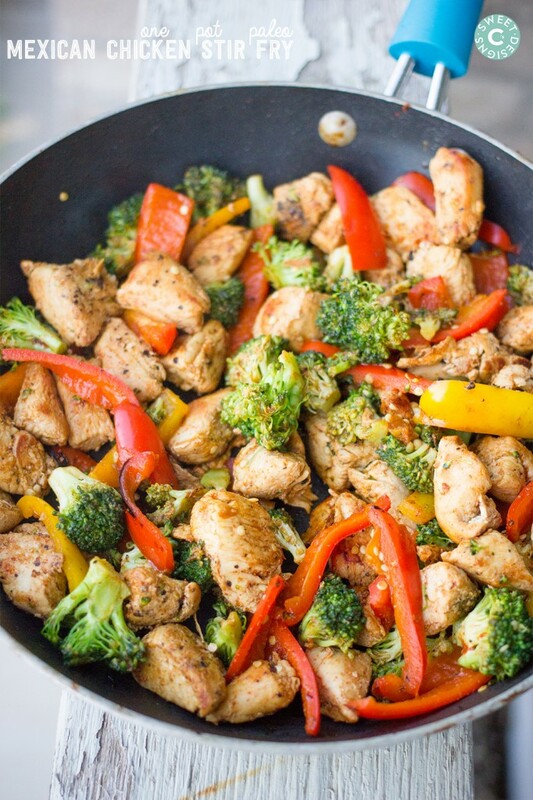 Add the seasonings to taste, and enjoy! Top with some fresh cut basil and cut into 6 serving sizes about 3×3 inches each. 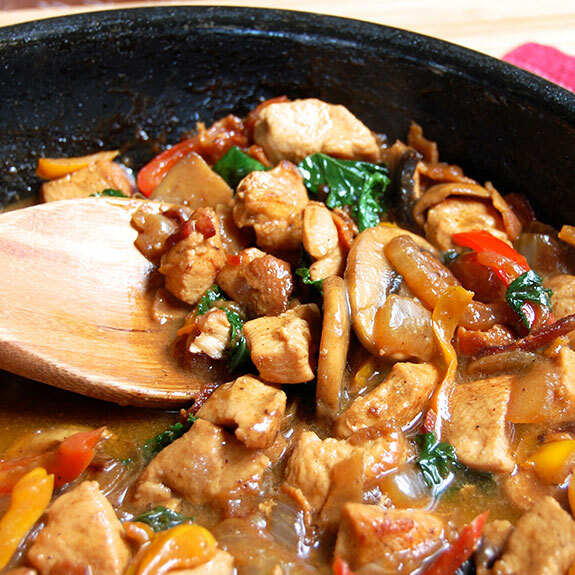 This dish from Lexi’s Clean Kitchen is fully of nutrients and taste! You don’t have to use roast garlic, you can saute it to save time (and to avoid heating up your kitchen as much). Lightly rub salmon with olive oil and sea salt, set aside. In a bowl combine shaved or sliced apple and fennel, pomegranate seeds, and apple cider vinegar- toss and set aside. Massage kale with olive oil. In a skillet heat 1/2 tbsp olive oil and garlic. Add in massaged kale and sauté until wilted, sprinkle with sea salt as desired. While cooking, place oven on broiler (high) and place salmon into the oven. Broil for 7-9 minutes based on size of your fish. 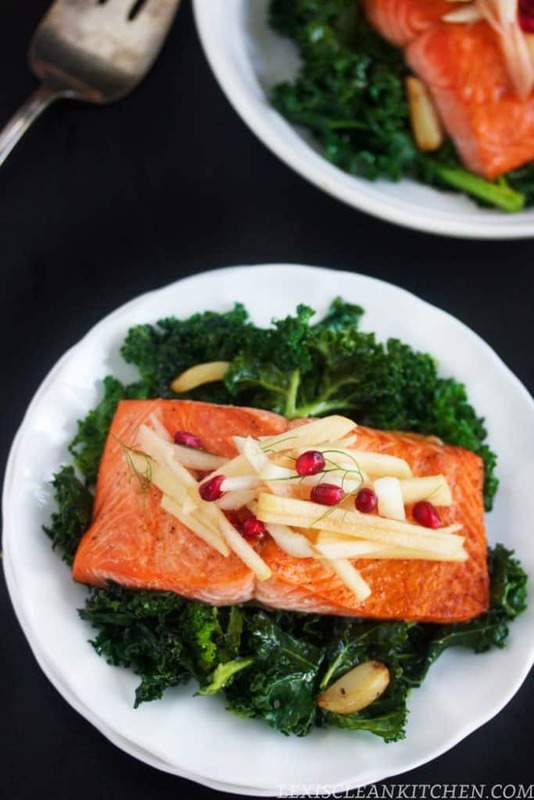 Plate by placing kale down, salmon on top, and apple fennel salad to garnish. *One head if you are roasting your garlic first, 2 cloves if you are just sautéing with garlic. **You don’t have to use roasted garlic, you can simply sauté your kale with garlic while cooking. 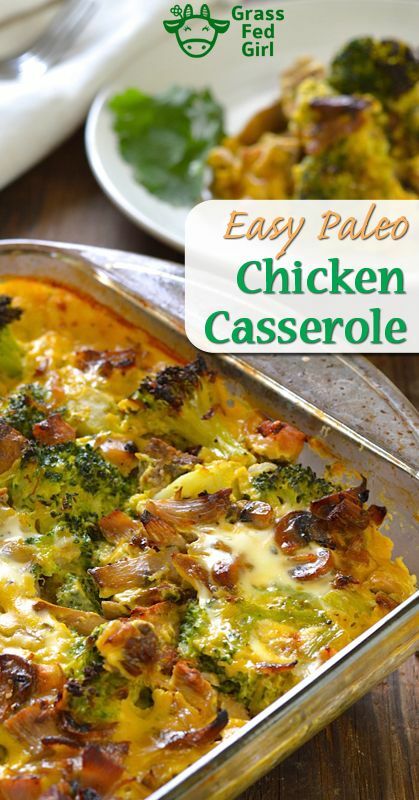 PaleOMG is one of my favorite Paleo food bloggers ever. She is funny, sarcastic, and her recipes are the bomb. She also has a new cookbook out that you can get on Amazon that has 100 gluten free recipes! Place all ingredients for the carne asada in crockpot, cover and cook on low for 7-8 hours. Use a fork to shred the carne asada and leave in crockpot on warm while you make the rest. Preheat oven to 375 degrees. Line a large baking sheet with foil and place a cooling rack on top. Wash sweet potatoes then slice into fry size pieces. Toss fries in ghee and sprinkle with salt. Place all fries on cooling rack without overlapping. Place in oven to bake for 30 minutes then turn fries over, sprinkle with adobo seasoning, and cook for 15 more minutes to help cook evenly. While sweet potatoes cook, make the tomato salsa: mix all ingredients in a bowl then cover and place in the fridge to cool. Make the guacamole: mix all the ingredients in a bowl then cover and place in the fridge to cool. Once sweet potato fries are done cooking, remove from oven and place on a baking sheet or in cast iron skillet, top with cheese then place back in the oven for 10 minutes to melt cheese. Lastly, top fries with shredded carne asada, tomato salsa, guacamole, cilantro, and jalapeños!